The Event Center at UMBC was an exciting and huge cleaning project. All 172,000 sq feet needed to be cleaned including all 5,000 seats and overhead supports. General Contractor, Barton Malow, selected Schuman’s Cleaning Service for our ability to handle such large projects. John Workman and his amazing team cleaned every inch of this project and proudly finished in time for the first major event. This multi-purpose facility is located on campus adjacent to the UMBC Stadium Complex. The new facility will host all UMBC NCAA athletic games for men’s and women’s basketball and women’s volleyball, as well as provide a venue for a variety of events, such as commencement, concerts, featured speakers, and banquets. John and our commercial cleaning crew are getting ready to start on the new Hotel & Conference Center at University of Md. What a beautiful new facility for College Park. Once again we look forward to working with the Project Managers from Southern Management as we take on this massive project. Plenty of windows to enjoy the view. Post construction cleaning at the new Easton Readiness Center in Easton Maryland by Harkins Builders. 2. 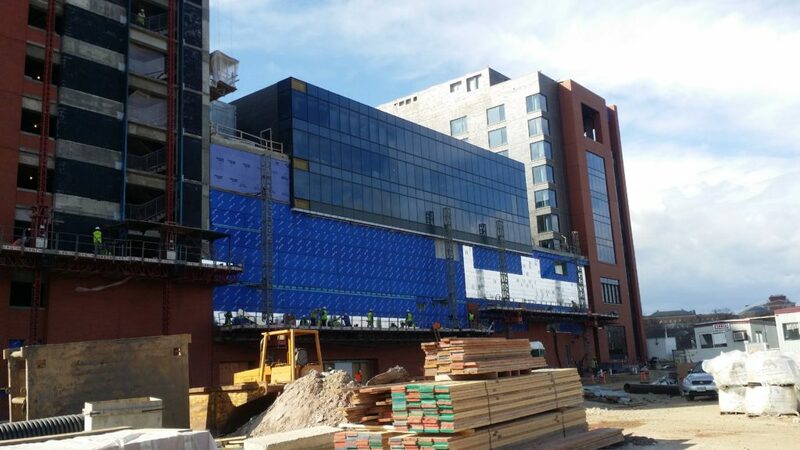 Post construction cleaning at the new Under Armor Cheer Building in Baltimore Maryland by DPR Construction. 3. Post construction cleaning at the new Denton Shore Medical Building in Denton Maryland by Willow Construction. 4. Post construction cleaning at the new Sailing and Family Activity Center in Annapolis Maryland by Coakley Williams. 5. Post construction cleaning at the new Gunston School in Centreville Maryland by KRM Development. This project has transitioned in to regular Janitorial Cleaning by Schuman’s. Schuman’s Cleaning Service Inc has been awarded the post construction cleaning on Mid Atlantic Surgical Group’s 10,000 squarefoot surgical center in Salisbury Maryland for Willow Construction. Mid Atlantic Surgical group provides the most advanced surgical care to the Eastern Shore of Maryland, Virginia, and Delaware for general, bariatric and vascular surgeries. Galloway Meadows is a new Apartment Rental Community in Easton, Maryland, currently under construction. Scheduled to open in Spring 2018 offering affordable housing and a variety of floor plans. Schuman’s Cleaning Service Inc has been selected by Willow Construction to perform the post construction cleaning on the 76 apartments and community center. Morgan Keller has awarded the post construction cleaning of one of its newest projects in Gaithersburg, MD to Schuman’s Cleaning Service Inc. The Lofts at Downtown Crown includes 130 Condominiums plus a parking garage . Schuman’s Cleaning Service Inc awarded post construction cleaning on new 8321 Hotel in College Park Maryland. Southern Management has awarded Schuman’s Cleaning Service Inc the post construction cleaning on the 8321 Hotel. This 150 room hotel is located in College Park Maryland. Tucked away in Church Creek, Md just outside of Cambridge on Maryland’s Eastern Shore, is the new Harriet Tubman Visitor Center and National Park. Filled with exhibits, artifacts, and rich history of this hometown hero who led so many to freedom along the Underground Railroad. Schuman’s is excited to be entrusted with this exciting new destination and will be providing twice weekly, heavier cleaning services through our janitorial cleaning division.